In this simple eye look, I've matched a lilac/taupey shade with a bit of blue. Note: These pens were provided by ELLIS FAAS in the course of last year. 1. Apply with brush or finger the lilac/taupe shadow of E106 to the inner two-thirds of the lid. Fade out the edges with finger. 2. 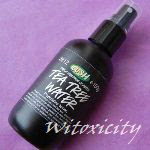 Apply with finger a thin layer of the dark blue of E203 to the outer half of the lid. The blue is subtle here, so use a light hand. 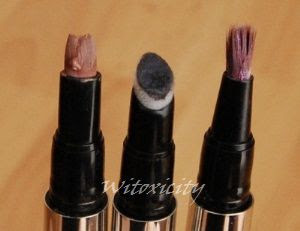 Smudge out the edges with finger. 3. 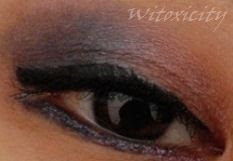 Line the upper lash line with the eyeliner - a fine line on the inner corner and much thicker on the outer half. Wing it ever so slightly. I used a separate angled eyeliner brush. 4. Tightline with any black eyeliner. 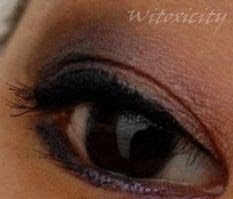 I used Stila Smudge Pots gel eye liner in Black. 5. 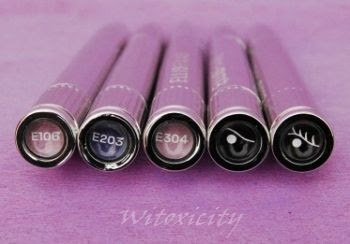 Use an angled eyeliner brush to line the lower lash line with the dark blue of E203. At the outer edge, mirror the shape of the eyelining on the upper lash line. 6. Apply a thin line of the metallic lilac of Light E304 on top of the dark blue lining just drawn. On another note, the nail polish in the first image will be featured in the next post. OMG! it's just amazing! i'm impressed with this makeup! so beautiful! Thanks, KTee! Oh, the matching was sheer coincidence. When I realised it, I thought it wouldn't do any harm to take an eye photo with the nails. Haha! Tem sempre algo lindo para se ver. 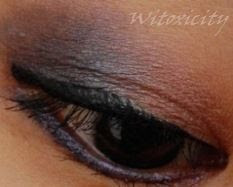 this is such a gorgeous EOTD! 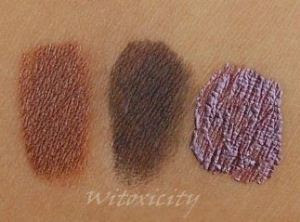 you have great blending skills and the eyshadows look so great together!